Because the protocol of our politics demands that foreign policy be conducted solely in terms of idealism, American politicians and public figures have always been uncomfortable dealing with thugs and despots. We are unable, at least in our public life, to manage the cheerful and practical cynicism that comes so easily to our British cousins. “He may be a thug, but he’s our thug” must be considered a deeply shameful attitude by any American politician with national ambition. And so no one can acknowledge that the national interest of United States sometimes requires it to do business with dictators. We have to pretty them up as our “friends”, and George W. Bush has refined this art, lionizing all the petty thugs that prudence requires him to ally with as “America’s good friend”, or “a great friend in the War on Terror”, or — God help us all — “a friend of Freedom”. Which brings us to General Syed Pervez Musharraf. On September 10th, 2001, this stalwart friend of the United States was anathema. Under his aegis Pakistan’s ISI had nurtured, brought to power, and maintained the Taliban in power in neighboring Afghanistan. The brutes in Kabul were Musharraf’s and Pakistan’s little Islamist hobby, a way to allow those boisterous military types in the ISI to get their jollies without upsetting the applecart back in Islamabad. Add the Islamic Bomb to the equation, and Pakistan could only be consigned to the Outer Darkness of our foreign policy. On the bright morning of the following day, though, everything changed. Mushy got a little dose of the carrot and a little dose of the stick, and overnight became a zealous ally in the War on Terror. But General Musharraf is not all that different from some of the other Third World Dictators who receive quite different treatment at the hands of the Great Satan. Saddam Hussein got death, because he fell foul of the United States, lost a war, got caught, stayed alive through the legal proceedings wearing a natty suit and a personality that alarmed Iraq’s newly installed rulers. Gen. Musharraf gets dinner at the White House because he knows what’s good for him (down to the bit about proper attire). He’s got a good point there. So what does Mushy have that Saddam didn’t have? More brains? Hardly. Saddam was brilliant in his evil, a shrewd and clever strategist. He stayed alive and in power for thirty-five years in the most brutal and lethal political environment on earth. Saddam was no dummy; it must have been something else. Look at it this way: suppose A. Q. Khan had done his work a little faster, or imagine that the DPRK and Saddam had been able to work out a mutually acceptable deal back in the 1990s. Pretend that when March 2003 rolled around, Saddam had a dozen or so Scud-B missiles tipped with 20-kiloton nuclear warheads, warheads that he could lob into Tel Aviv, Incirlik, or Kuwait, or at the U.S. fleet in the Persian Gulf. Would the Marines have made the long march up to Baghdad anyway? Would the statues in the squares have still been toppled? Or would Saddam now be sitting next to our President, wearing his dinner jacket and smiling for the photo op? Would he be lionized as a “true friend in the War on Terror”? The most that can be said about hanging dictators and heads of state is that it serves to deter others. The clever ones know that that’s not true either. The real message is “unless you have one of the permanent members of the UN Security Council backing you, don’t mess with America”. The clever ones get it. But, to be completely accurate, Nitin Pai should have added a clause: “unless you have one of the permanent members of the UN Security Council backing you, or an arsenal of nuclear weapons”. Of All the Deaths in 2006 Whom Will You Grieve the Most? Even though Saddam Hussein’s death is taking up all the room in the mausoleum at the moment, 2006 brought other, more sorrowful deaths. When I think of Gerald Ford, I always think of a comment my uncle made a couple of years after Ford was defeated by Jimmy Carter. We were having a little group rant about media bias and my uncle brought up how the press had portrayed Gerald Ford while he was in the White House. Ford had been depicted during his presidency as a not too bright, physically spastic guy bumbling along through his presidency. The shot of him tripping on the steps of Air Force One or the story of his golf drive beaning a spectator were repeated over and over until they became national jokes. Chevy Chase made a career of Fordian pratfalls on Saturday Night Live. But, as my uncle pointed out, Ford was anything but dim. He had been Editor of the Law Review at Yale, a great honor at one of the country’s leading law schools. He worked his way to the highest position in Congress that a Republican could hold at the time. He was a popular and effective leader in congress, and was reelected by large majorities in more than ten congressional elections. Ford had what his predecessor lacked... not only a superior analytical mind, but also a healthy dose of “emotional intelligence”. And more to the point, Ford was hardly uncoordinated. He was probably the best natural athlete to hold the nation’s highest office. He was a football All-American at the University of Michigan and, in later years, a quite good golfer. I’ll never forget seeing him play at the tournament named in his honor held annually at Vail, Colorado. While in his mid-seventies, he competed well in a field of retired and semi-retired professional golfers. The way that Gerald Ford was misrepresented by the press is a severe blot on that institution. Ford was a truly honorable man. He made the difficult but necessary decision to pardon Nixon, which he knew his political enemies would use to hinder his reelection. The media will now writing lofty articles about his life and times, but it should not be forgotten how they treated him when it really mattered. And how about James Brown? James Brown has had more honorifics attached to his name than any other performer in music history. He has variously been tagged “Soul Brother Number One,” “the Godfather of Soul,” “the Hardest Working Man in Show Business,” “Mr. Dynamite” and even “the Original Disco Man.” This much is certain: what became known as soul music in the Sixties, funk music in the Seventies and rap music in the Eighties is directly attributable to James Brown. His transformation of gospel fervor into the taut, explosive intensity of rhythm & blues, combined with precision choreography and dynamic showmanship, served to define the directions black music would take from the release of his first R&B hit (“Please Please Please”) in 1956 to the present day. Truth cannot be extinguished. Individual bearers of its light can be obliterated, but the Truth in all its absoluteness, is eternal. I am with Plato on that one. Not that Truth cannot change or transform itself in our own minds. The more we discover, the more humble we become before the altar of That Which Is, in all its appearances - whether Newtonian or Einsteinian or Mother Theresean. That is why Islam in its worst forms cannot win. It can and will cause great death and suffering - its very brittleness and exquisite sense of grievance make certain the preceding maelstrom before its eventual demise in the face of Truth’s freedom. Islam demands security of belief; Truth will never accede to that. We humans are a bloody lot; we will not go peaceably in the face of the inexorable. Meanwhile, as we strive for supremacy, Truth leads us patiently on. Of those who died in 2006 whom will you grieve the most? First, though, let me say that I thought the Iraqi authorities had taken into consideration the timing of the festival of Eid and had taken pains to avoid having Saddam's execution desecrate a holy day. It now seems they went out of their way to do the opposite. I am very happy that Saddam is dead. He was an evil man and the world is better off without him. However, I am both furious and disgusted by the way the 'iraqi' govt. handled it. In one swoop they managed to turn it into a complete farce and rip apart Iraqi unity rather than mend past wounds. 1. Was it necessary to have a bunch of sadr street thugs carry out the execution in a dungeon looking room? Even the effin insurgents manage to do their executions in nicer environments.... and they wear matching outfits. 2. Killing him on the morning of eid to the chant of 'muqtada muqtada muqtada' was an abomination. When I saw the official execution video, I couldn't understand why they had muted the sound. But after seeing the camera phone footage, it makes sense. Nearly every Iraqi I have spoken with believes this was literally an eid gift to iran, courtesy of his willing puppet maliki. 3. And if there was ever any doubt that the dawa party and maliki weren't in bed with sadr, I think the fact that his henchmen got to execute Saddam should make it obvious to everyone. 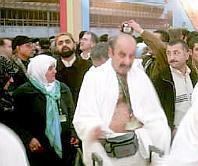 Many felt sorry for saddam, he looked like a helpless old man, and all those guys in masks chiding him only made it worse. This opinion was coming from people who had family members killed by him. That is ridiculous. They all thought he needed to die, but they were all very unhappy with how it was done. In the end, the Iraqi govt. once again proved they have no interest in Iraq and that they are completely controlled by iran. I really can't imagine why it's so hard for the US govt. to recognize and respond to this situation but we just won't. This amounts to malignity by a theocratic state. The Americans should have refused, intervened,or done whatever it took not to play into the hands of the Iranians dressed up like Iraqis. Again, I find the American cooperation on the timing of this, whether through ignorance or a wrong-headed (again) policy of hands-off at just the wrong moment, disturbing in the extreme. Will our State Department ever grow up? I ask this question not knowing if Foggy Bottom was directly involved or not. If they weren't handling this momentous event then that was dereliction of duty. If they were involved and allowed the timing to be carried forward into the Eid holy period, they are either stupid or deliberately dangerous to this administration. Either way, they are as perfidious as those executioners who would not permit Saddam (former secular atheist) his final prayers. What do you think was the most momentous event of 2006? Not counting, of course, the personally meaningful births, deaths, or other rites of passage that happen in each family. Those cannot be gainsaid. In my country’s history March 2003 was boots-on-the-ground in Iraq. In my personal odyssey it turned out to be the final birthday of my daughter, who was to suddenly die six weeks later. As I recall, it was not a particularly happy birthday…she was rushed, and didn’t look well. But for some reason, in contrast to my usual funny cards, I had picked up a mushy, mother-daughter birthday card and tucked some money in it. But that was three and a half timeless years ago. Meanwhile, there is December 30, 2006. The Impending Death of a Tyrant, with all the rumors of delay, of it having already happened, of assurances it would never happen. Perhaps it is the tendency to look at what is most recently in front of us that makes the death of Saddam Hussein seem the most important event of the year. Time fatuously made the Person of the Year for 2006, “You” - whoever that is. Had they the sense to frame it as Martin Buber’s “Thou” it might have had some resonance. But simply as “You” it becomes self-referential and essentially narcissistic. But I realized in every household that someone had already lost his or her mind; in other societies such a person would be in a mental hospital. I also realized that there wasn’t a household that did not mourn at least one family member who had become a victim of this police state. I wept with relatives whose son just screamed all day long. I cried with a relative who had lost his wife. Yet another left home every day for a “job” where he had nothing to do. Still another had lost a son to war and a husband to alcoholism. As I observed the slow death of a people without hope, Saddam Hussein seemed omnipresent. There were his statues; posters showed him with his hand outstretched or firing his rifle, or wearing an Arab headdress. These images seemed to be on every wall, in the middle of the road, in homes. Those images are gone now. Only their nightmares and the terrorists remain. For the latter, whatever they say to the contrary, Saddam’s death is a body blow. Even though it waited until almost the last moment of 2006, the departure from this world of a truly evil - relentlessly evil - human being is a moment to be lived in relief and wonder. It is as though there is a black hole where once he stood. Ah, if just for a moment, the exultation at the cessation of evil...for a moment, you can hear "the endless song above earth's lamentation." The Swedes love the black people and the brown people and the red people and the yellow people. That’s why they invite thousands of them in every year. They love the Muslims and the Sikhs and the voodoo doctors. They love the Somalis and the Turks and the Pakistanis and the Samoans. But there’s a limit of tolerance beyond which not even the Swedes will go. Want to guess where they draw the line? An American woman has been refused treatment by a doctor in Blekinge in southern Sweden because of her nationality. The woman’s husband has now reported the incident to the Medical Responsibility Board. Valery Johansson, who lives in a small town just outside Nashville, Tennessee, was in Sweden to celebrate Christmas with her husband’s family. On Christmas Day, worried that she may have contracted strep throat, she sought medical help. Her husband and niece made an appointment for her at a clinic in the town of Karlshamn. “We went up there and the nurses were really nice. They did some swab tests, which they then passed on to a doctor,” Johansson told The Local. But when the American woman, accompanied by her husband and niece, went to meet the doctor in his treatment room, he declined to examine her. Rather than introduce himself, the doctor waved the patient’s papers and shouted “she doesn’t have strep throat, she doesn’t have strep throat”. He then added that he would not treat her. “He said he didn’t like Americans,” said Johansson. He also disliked hearing English spoken in his treatment room and soon walked out. “We just couldn’t believe it. We were left standing there with our mouths hanging open,” said Johansson. According to Johansson, the doctor was a Palestinian who objected to American foreign policy in the Middle East. In the report Johansson has claimed that she was discriminated against on ethnic grounds. Before returning to the United States at the beginning of January she also intends reporting the incident to the American Embassy in Stockholm. Stockholm. The worldwide center of human rights. The Olympus of Moral Superiority. The home of those high-minded folks who love to lecture the American barbarians on their misguided, ignorant, and benighted ways. Remember the pig races in Katy, Texas? The ones that were organized in a lot next door to the future site of a mosque? Craig Baker, a resident of the community, felt that the Katy Islamic Association was pushing him around and trying to get him to move, so he decided to exercise his constitutional right to race his own pigs on his own property. The Islamic Association tried to mau-mau him into submission in the usual CAIR fashion, but he’s a Texan, and stuck to his plan. His idea generated a lot of local enthusiasm. Donations poured in to help him fund the races, with at least one case of a $1,000 gift. Now he’s ready: the first race was officially run last night while local Muslims were at their Friday prayers. KATY — A Muslim group said it is no longer offended as Katy resident Craig Baker made good on his promise to stage Friday pig races next door to an 11-acre property the group has purchased to build a mosque. While members of the Katy Islamic Association attended afternoon prayer services, Baker was busy next door at 1918 Baker Road lining a track for 25 pigs to race on and assembling merchandise to sell to the spectators. About 100 people showed up for the event in the pouring rain. A spokesman for the association, Yousef Allam, said members are no longer offended by Baker’s decision to race pigs, a forbidden meat in the Muslim culture, despite a Dec. 1 letter an attorney for the group sent to Baker demanding that he immediately remove the pigs from his own property. Baker, 46, said his intention is not to offend anyone with the races but to make clear that he will not be forced to move or relocate his marble-fabricating shop as he claims a member of the association previously urged him to. Can you believe it? Muslims weren’t offended! That has to be a first. There’s a video of the event that you’ll all want to see. “Things changed with them saying maybe it would be a good time for you to consider packing up your family and packing up your business and moving somewhere farther out in the country,” Baker said. Baker said Kamel Fotouh, the association’s president, deeply offended his family whose ties to the land goes back some 200 years in suggesting that they pack up and leave. His 90-year-old grandmother, Anna Baker, was the first female bus driver for the Katy Independent School District. Allam said if any interaction between the group and Baker was interpreted as a threat for Baker to vacate his land, it was unintentional. “If we somehow communicated that to him, then we apologize,” Allam said. A Muslim apologized! Stop the presses! Hell has frozen over! Pigs Camels have flown! Mr. Baker is a 21st-century American, so it is only natural that he has set up a website, “American Pig Race”, to promote his cause. The site is liberally decorated with a variety of pig icons, and has pig-related merchandise for sale — with all proceeds going to charity. My Moslem neighbors have decided to take their fight with me to the media, hoping that by making this fight public I will come off as a red neck racist from Texas. On 11/29/06, ABC Channel 13 News reporter Ted Oberg came out to check on a dispute between neighbors. Oberg sat in my office filming me for over two hours to produce a 3-minute segment. Since that time I have done two other TV interviews one with CBS Channel 11, and one with Fox Channel 26. I also gave interviews for the print media to the Houston Chronicle, the Katy Times, and the Associated Press. I have done one live radio interview for the Fox News Radio with Spencer Hughes. On Thursday 11/30/06 Rush Limbaugh made mention of this for almost three minutes, then again on 12/07/06 Rush brought the matter up again. The situation was talked about by Michael Savage on 11/30/06 and was found on his website. Now, there’s a Texan in action. What I notice in all this brouhaha is the similarity (albeit on a smaller scale) between the Danish Motoon Crisis and the Baker Road Pig Races. The Texans in Katy reacted like the Danes did to the Motoon violence, and had a similar effect. 1. Muslims get offended by something an infidel does. 2. The infidel is immediately reviled by Islamic organizations and vilified by the dhimmis in the Western press. 3. The Muslim “street” rises up to toss Molotov cocktails and break windows. 4. Lawsuits and other legal actions are initiated against the offensive infidel. 5. Muslim leaders “regret” the violence, but point to the understandable rage of the average Muslim whose Prophet has been insulted, with a veiled threat of more violence in the absence of concessions. Now we come to a fork in the road. The infidel at this point can take either the dhimmi fork, or the Holger Danske fork. 6. Infidel engages in submissive behavior: apologizes, appeals for mutual understanding, expresses good intentions, etc. 7. Muslims ramp the rage up a little higher to gain more concessions. 8. Infidel authorities adopt full dhimmi position, increasing funding for outreach programs (paying the jizyah), passing legislation to protect Islam from disrespect (acknowledging the supremacy of the Koran and the religion of Allah), and making concessions on some Muslim issues, such as allowing the wearing of the niqab (accepting shariah). 9. Muslim leaders pat the good dhimmi on the head and accept his apology. 10. Muslims occupy their new and more strongly fortified position, awaiting the next opportunity. 6. Infidel resists dhimmification and takes legal action, raises funds, publicizes his case, etc. 7. Muslims up the ante, and hit him even harder with more lawsuits and threats. 8. Infidel refuses to give in, and launches a counteroffensive in the press and the courts. 9. Muslims suddenly abandon their position, concede that the infidel is not really that bad a guy, and pledge to “work for full understanding with members of other faiths”, etc. 10. Things go quiet. Muslims bide their time, awaiting the next opportunity to foment a useful crisis. Note that both forks end with Muslims biding their time, awaiting their next opportunity to create yet another crisis. But the Holger Danske fork leaves them occupying a much weaker position. We all know that the cessation of hostilities is only temporary, and that the resulting calm is that of the hudna — the tactical truce that Islamic forces accept until they can renew their offensive from a stronger position. But the dhimmi fork doesn’t even result in a hudna. If Holger Danske stands firm every time, the aggressive Islamic forces gain no ground and are pushed ever-so-slightly back. There’s a lesson here for all of us in the West. Of the three, my money’s on Texas. It has the fewest gun control laws. Hat tip for the video: Pierre Ménard. Fortunately for all concerned, she jumped out of the way in time. In a highly unusual move, Sen. Barbara Boxer of California has rescinded an award to an Islamic activist in her home state because of the man’s connections to a major American Muslim organization that recently has been courted by leading political figures and even the FBI. Boxer’s office confirmed to NEWSWEEK that she has withdrawn a “certificate of accomplishment” to Sacramento activist Basim Elkarra after learning that he serves as an official with the Council on American-Islamic Relations (CAIR). After directing her staff to look into CAIR, Boxer “expressed concern” about some past statements and actions by the group, as well as assertions by some law enforcement officials that it “gives aid to international terrorist groups,” according to Natalie Ravitz, the senator’s press spokeswoman. CAIR, which has 32 offices around the country and bills itself as the leading Muslim-American civil- rights group, has never been charged with any crimes, nor have any of its top leaders. But a handful of individuals who have had ties to CAIR in the past have been convicted or deported for financial dealings with Hamas—another reason cited by Boxer for her action. The senator directed her staff to withdraw the certificate—which she routinely gives to community leaders in California—and asked that a statement she had previously made endorsing CAIR be stricken from the group’s Web site, Ravitz said in an e-mail. While we could sniff and say “better late than never”…let’s not. Her back-tracking is wonderful, welcome news. Now, would someone please tell her that Rep. Ellison from Minnesota had his campaign financed by this very same group? CAIR may have jumped the shark with this one…let’s wait and see. “I sacrifice myself. If God wills it, He will place me among the true men and martyrs,” wrote Saddam in the letter, which his lawyer said was penned last month for release if his death sentence was upheld. Fortunately, we do not know God’s will. But we do know the will of the Court in Iraq. May it be done, and done quickly. Meanwhile, for a good fisk of the MSM wringing its collective hands on how to cover the hanging “tastefully” see In From the Cold. Former Spook points out that none of them were so concerned with ‘tasteful’ when it came to showing our own citizens beheaded, blown up, and psychologically tortured. It never seemed to bother them that some of the relatives of these victims could have been watching their shows at the time. The MSM has no more taste or conscience than John Kerry and T. Kennedy put together. At the Battle of Poitiers in 732, the Frankish king Charles Martel defeated the Saracens and pushed the forces of Islam back into the Iberian Peninsula. It was not until 1492 that the Moors were finally thrown out of Europe, but in the meantime the Islamic virus was contained in Spain and Portugal, and thus kept out of the heart of Western Europe. One of Charles Martel’s comrades-in-arms at Poitiers was a warrior of the North known as Ogier le Danois, later Holger Danske, or Holger the Dane. Although Holger was a historical figure, little is known of him, and most of the written material about him is drawn from legend. According to the chroniclers, Holger had previously done battle with the Franks over their incursions into Danish territory. But in 732 the menace of the Saracens forced him to set aside his differences with Charles Martel and journey southwards to fight side-by-side with the Frankish forces against the common enemy. At the end of his days, Holger, like King Arthur, retired to a secluded keep to enter a twilight sleep from which he will awake in the hour of his country’s need. The location most frequently cited for Holger’s rest is Kronborg castle at Helsingør (or “Elsinore”, per Shakespeare). Men pragten i det hele er dog det gamle Kronborg og under det er det at Holger Danske sidder i den dybe mørke kælder hvor ingen kommer, han er klædt i jern og stål og støtter sit hoved på de stærke arme; hans lange skæg hænger ud over marmorbordet hvori det er vokset fast, han sover og drømmer, men i drømme ser han alt hvad der sker heroppe i Danmark. Hver juleaften kommer en Guds engel og siger ham at det er rigtigt, som han har drømt, og at han godt kan sove igen, for Danmark er endnu ikke i nogen ordentlig fare! men kommer det i en, ja, så vil den gamle Holger Danske rejse sig så bordet revner, når han trækker skægget til sig! så kommer han frem og slår så det høres i alle verdens lande. But the fairest sight of all is the old castle of Kronborg, and under it sits Holger Danske in the deep, dark cellar which no one enters; he is clad in iron and steel and rests his head on his stalwart arm; his long beard hangs down upon the marble table where it has become stuck fast; he sleeps and dreams, but in his dreams he sees everything that comes to pass in Denmark. Every Christmas Eve an angel of God comes to tell him that all he has dreamed is true, and that he may go to back to sleep again, for Denmark is not yet in any danger! but if it should ever come, then old Holger Danske will rouse himself, and the table will break apart as he pulls out his beard! Then he will come forth, and strike a blow that shall be heard throughout all the countries of the world. Holger Danske has put me in mind of my favorite English poet, Ted Hughes. Hughes was a Yorkshireman, and the blood of the Danes runs thick in the veins of Yorkshire. Especially in the North Riding — the closer one gets to Whitby, the more natural blond hair in evidence, and the more obvious the Danish place names. Ted Hughes wrote a number of poems that touched on the Men of the North, and I’ve collected some samples below. Warning to our Danish readers: this is modern poetic English! It may try your skills a bit, but your efforts will be rewarded. I made my way through the Holger story in Danish, so fair is fair; now it’s your turn. over the steep sheen of the water-globe. And the elaborate, patient gold of the Gaels. Into the iron arteries of Calvin. Then they grow grey, like men. The third section of Ted Hughes’ “Gog” evokes Holger the most strongly. This is a deep, dark, and difficult poem, and parts of it are not suitable for family reading. It deals with the lifelong and ultimately futile efforts of Everyman to escape from the softness and weakness of his mother and establish his own manhood without being sucked in and corrupted by the softness and weakness of his wife. shaking his plumes clear of dark soil. Gallops along the world’s ridge in moonlight. We all know about the Twelfth Imam, the super-bad Muslim guy at the bottom of the well in Persia. When Armageddon arrives, when Gog grapples with Magog and battle rages across the plain at Megiddo, the Twelfth Imam will awaken and lead the armies of Islam to their final victory, establishing the kingdom of Allah here on Earth. We’ve got our own dude sitting on the bench. Call him the Twelfth Viking. He’s suited up, ready to join the contest as soon as he’s required. The Men of the North form the core of the Counterjihad. They are already in action, clearing the back alleys of Anbar Province, riding point in Kabul, and forming up in self-organized groups to defend our borders with Mexico. As I’ve said before, it’s not race that’s the issue here, it’s culture. 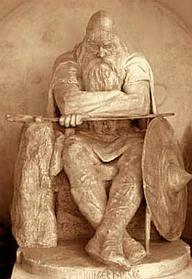 The culture of the Danes, the Norsemen, the English, and the Celts. The culture of the hardy and self-reliant Men of the North, always ready to defend their ancient liberties with a ferocity that their enemies can scarcely imagine. The culture of productive enterprise and armed self-determination that has spread to all corners of the globe. Holger Danske is the man who best represents us. He’ll be there in the hour of our greatest need. I can recommend this fascinating video (apparently produced in the Netherlands) about the DPRK, entitled “Welcome to North Korea”. It’s long — almost an hour — but every minute is worth watching. A tour of North Korea is the closest anyone can come to visiting an alien civilization. We’re in Year 89 of the Juche calendar — and counting. According to the most recent news accounts, Ethiopian forces have driven the Islamists out of Mogadishu and returned control of the capital to the official Somali government. The leaders of the Islamist alliance that held most of the country until this week have resigned, SomaliNet news agency reported. “Since the Islamists came to power in Somalia, they did a lot of significant acts for the people, particularly in terms of security, justice, development, improving internal and foreign politics, reopening the air and sea ports and so on,” the outgoing leadership said in the statement. Islamist fighters are said to have handed their weaponry to warlords in the Mogadishu area. These were the same mujahideen who swore their dedication to martyrdom as recently as yesterday. Apparently not all of them were ready for the blandishments of the seventy-two black-eyed ones. The Somalia Islamic Courts Council’s (SICC) website hailed “mujahideen” troops who, it said, chanted passages from the Koran as they went into battle against militarily superior Ethiopian “crusaders”. Ethiopia is a largely Christian nation. The battle for Mogadishu occupies just a small section of the long, convoluted, and bloody border between Islam and the rest of the world. The Ethiopian government is not attacking the Somalis to convert them to Christianity, but the Somali mujahideen obviously do consider this a struggle between their religion and the barbarian faiths of Ethiopia. They called a jihad, and asked for assistance from faithful Muslims all over the world in their fight. Unfortunately, their fellow jihadis failed to arrive ahead of the Ethiopian Air Force. The Scotsman supplied no URL for the website of the Somalia Islamic Courts Council. A search for it turned up Golaha Maxaakiimta Islaamiga Soomaaliyeed, which may be it. Unfortunately, it’s entirely in the Somali language. There are, however, various other Somali jihad blogs and websites dedicated to the same cause and writing in English. One of them is the Islamic Courts Council, run by Abusayfullaah As-Somaali. He hasn’t posted for a week, which may or may not be significant. Shabelle News managed to speak to Shaykh Indho-adde (white eyes) over the phone. He told Shabelle by the phone that the fighting was going on between the Ethiopian forces and the Islamic Courts fighters, indicating that he does not recognize the internationally backed government in Somalia. “I would be pleased to die in the Jihad (a holy war) while I was killing the Christian Ethiopian troops that forcefully occupied our country”, he said. “We will not halt the war until our forces reach the border between Somalia and Ethiopia”, he added. Notice the emphasis on Christian Ethiopian troops. Another Somali Islamist blog is The Ignored Puzzle Pieces of Knowledge, where the blogger is one InshAllahShaheed. In Somalia, the Jihad fe Sabeelillah against the Crusaders has been going on for a few days, walhamdullilah. The disgraceful Ethiopian Kafireen have started to cowardly fight the Somalians by using warplanes and jets like their cowardly counterparts: the Americans and their allies. Those sissy school girls backed by the United Snakes of Amerikkka are too cowardly to fight like men on the ground with guns. AllahuAkbar, the Somalian Mujahideen are showing Sabr and are moving forth fe Sabeelillah without fearing death. I don’t know where InshAllahShaheed hails from, but “United Snakes of Amerikkka”?? Does he hang out at Daily Kos when he’s off-duty from the jihad? As a matter of interest, InshAllahShaheed has a whole page of video links for miscellaneous jihad war footage and snuff videos. I don’t recommend them to the faint of heart. The struggle in the Horn of Africa between the Muslims on the coast and the Christians of the highlands has been going on for a long time. A little bit of history is in order. Ethiopia (also known as Abyssinia, from the name of its highland regions) has been a major power in sub-Saharan Africa since the beginning of history. A large Jewish contingent was represented there as early as the eighth century B.C., having migrated overland from Egypt, or across the Red Sea from the Arabian Peninsula. 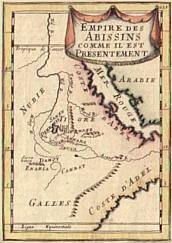 Christianity came southwards from Egypt to Abyssinia in the fourth century. After the initial period of conversion, the Ethiopian Church came under the authority of the Coptic Church in Egypt, with a Primate appointed by the Patriarch of Cairo. Christianity eventually became the predominant religion in Ethiopia, though the country has been a patchwork of faiths since the earliest days. The Islamic conquests in the seventh and eighth centuries cut Ethiopia off from the rest of Christendom. The Legions of the Prophet subdued Egypt and Nubia (Sudan), and occupied the littoral along the Red Sea and around the Horn, but the Islamic tide washed up against the highlands of Abyssinia and then receded. At the end of the Dark Ages, Portuguese mariners set sail around Africa and into the Indian Ocean, looking for the fabled Far Eastern Christian kingdom of Prester John. When they discovered the Christians of Ethiopia, they thought they had found what they were looking for. At the time the Ethiopians were under duress from the onslaught of the newest Legions of the Prophet, the forces led by the Sultan of the Ottoman Empire. They asked the Portuguese for help, and in 1542 battle was joined by an alliance of European and African Christians against the Islamic army of the Turks. At first the Portuguese were defeated, but the following year they gained a decisive victory and the Turks were forced to withdraw. From the Portuguese point of view, the Abyssinians practiced a strange and aberrant form of Christianity, and the Europeans saw it as their duty to correct their doctrine and bring Ethiopia under the authority of the Church of Rome. The Ethiopians, however, would have none of it, and relations between the two countries soured. The Jesuits stayed on for a while, at first tolerated, later despised, and finally expelled. Ethiopia remained in its remote isolation from the rest of the Christian world until the great European colonial push of the nineteenth century. The French, the Italians, and the British all had encounters of various kinds with Ethiopia, but none was able to make the country into a colony. The British invaded and defeated Abyssinia in 1868, but did not remain in occupation. The Italians fought the Ethiopians at Adowa in 1896, and were astonished to be defeated by a large native force equipped with French weaponry. Mussolini avenged this affront to Italian dignity by invading, occupying, and annexing Ethiopia in 1936. The period between 1936 and 1941 was the only time in history in which Ethiopia was actually conquered by a foreign power. The Communist virus infected Ethiopia in 1974 when Emperor Haile Selassie was overthrown and a Marxist dictatorship established. During seventeen years of Communist rule the Ethiopian economy was laid to waste, famine raged through the land, and border clashes were fought with Eritrea and Somalia. The Church was severely persecuted under the Communists — the Patriarch was murdered by them in 1974 — but rebounded after the re-establishment of representative government in 1991. Ethiopia remains primarily Christian today. Considering this history, it’s no wonder that Ethiopia views the situation in Somalia with alarm: jihad has appeared on their borders yet again. The rest of us are fortunate that they were willing to mount a counterjihad against Mogadishu. One assumes that our government gave them plenty of tacit encouragement to do the job. After all, they were ideal for the task — they know the terrain, speak the language, and have a real vested interest in completing the task. Not only that, they are not going to be encumbered with the same Rules of Engagement which would tie the United States or NATO into procedural pretzels. It’s also unlikely that they will concern themselves overmuch with the Geneva Conventions as they apply to Islamic terrorists. The big question is: what comes next? Somalia has been ungovernable for nearly twenty years. Can the Ethiopians force stability on a bunch of Taliban-wannabes, feuding warlords, and backward tribesmen? Let’s see if the Legions of Abyssinia can accomplish what the United States and the UN so signally failed to do. Wretchard has an absolute must-read post today called “The Blogosphere at War”. It’s a first-rate analysis of the new internet-based information system that is now maturing, citing the blogosphere as the engine of change in how news is collected, analyzed, processed, and distributed. There is considerable interest in the idea that “blogs” are somehow able to offset the mainstream media’s (MSM) ability to sell a given narrative to the public, a power which is of considerable interest in peace and even more so in war. It is widely recognized that molding public perceptions through narratives is nearly as important in war as the outcomes on the actual battlefield. Palestinian Media Watch convincingly demonstrates that Arab and Muslim organizations have long made influencing international publics through print and broadcast media a strategic goal, especially in any confrontation with Israel. This effort has historically followed two tracks: the establishment of technically sophisticated media outlets like al-Jazeera to sell messages directly to audiences; and mounting information operations aimed at shaping the way in which Western Media outlets cover any issue of interest. For most of the Israel-Lebanon War of 2006 Hezbollah repeatedly accused Israel of atrocity and wanton aggression as a way of neutralizing its superior firepower; and little of this cant was rebutted in timely fashion. When on December 4, 2006 an Israeli think-tank release released a study, supported by imagery, showing that Hezbollah had fired its rockets from civilian localities all over southern Lebanon at civilian targets in Israel , the war had already been over for five months and Hezbollah had long achieved its public relations objectives. In pointed contrast to this ponderous performance, private individuals — bloggers — had managed to explode many Hezbollah atrocity accusations against Israel carried by the MSM in very rapid fashion. These blogger accomplishments included demonstrating that a wire service photograph of a bomb-damaged Beirut had been digitally altered to enhance both the smoke and the damage; that photographs of supposedly dead civilians posed artfully in the rubble were faked; and last but not least, the unmasking of an often photographed Lebanese humanitarian worker (The Green Helmet Man) as a brutal Hezbollah public relations agent callously arranging children’s corpses for maximum effect. While the actual effect of these exposes on the international diplomatic climate may have been slight, observers of the 2006 war in Lebanon had found their white knight. The rapid and often effective response of the blogosphere raised hopes that the Internet might provide a way to neutralize the massive Islamic investment in media outlets and information warfare cells. What is the truth? The only statement I would question is this one: It is widely recognized that molding public perceptions through narratives is nearly as important in war as the outcomes on the actual battlefield. Delete the word “nearly”. Our success on the battlefield in Iraq and Israel’s success in Lebanon have been overshadowed by the enemy’s success in manipulating the news coverage of these events. Our soldiers are superb and their martial skills are the greatest that history has ever seen. But we may yet lose the war because the people who control the portals of public information are cowardly and treasonous. The information war has become more important than the bombs-and-bullets war. Since the politicians are in thrall to the MSM, the dedicated information warrior has to detour around them. This is where Wretchard’s analysis and the work of the 910 Group converge. Half of the task is the collection, analysis, processing, and distribution of information. The other half is what we do with it. The Counterjihad is a proactive alternative to the traditional passive acceptance of what our leaders do on our behalf. Our leaders can no longer adequately protect us; other means of protection are even now being formulated. Distributed intelligence can be an active process. It is forming new structures and strategies for countering the mujahideen in their attempts to suborn, infiltrate, corrupt, and destroy all that we hold dear. Read Wretchard’s whole essay. It will help clarify the situation. 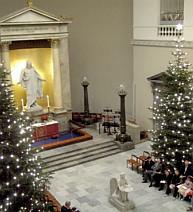 Steen of Snaphanen sent us a link to this video of a beautiful “Christmas Eve in Copenhagen Cathedral” (my translation of the title — no help from any Danes!). 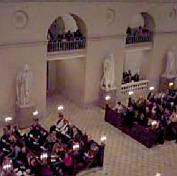 It was shot from the cathedral balcony while the organ was playing and people were singing. I could just about smell the evergreens and the candle wax. You can hear the congregation singing a carol (in Danish), one whose tune I don’t recognize, yet which seems oddly familiar. You did notice the famous Jesus by sculptor Bertel Thorvaldsen (died 1844). For some reason it’s one of the most famous Jesuses in the world. More information on Thorvaldsen’s Christ can be found at this LDS web commerce site, of all places. It seems that the Mormons have copied the statue and placed it in the Temple Square visitors’ center in Salt Lake City. Wasatch Sculpture makes small replicas of the piece and sells them over the internet. That Jesus fellow really gets around. Last month I reported on the investigation of Jamaat ul-Fuqra as carried out by the Christian Action Network. At the time I met with Martin Mawyer and his associates, the group had just completed a flyover of the Red House compound in a private aircraft. Now Martin has very kindly made the resulting aerial photographs available to Gates of Vienna. For readers who are unfamiliar with Jamaat ul-Fuqra, a quick synopsis: It was founded in 1980 in New York by a Pakistani Sufi named Sheikh Mubarik Ali Hasmi Shah Gilani, along with a front organization called “The Muslims of America”. Most of its members are American citizens, converted to Islam and recruited via the prison system. The group has been associated with assassinations and firebombings in this country and Canada, and various members have been charged with and convicted of criminal offenses. It is thought that the group obtains its funds through welfare fraud, money laundering, and other illegal activities. 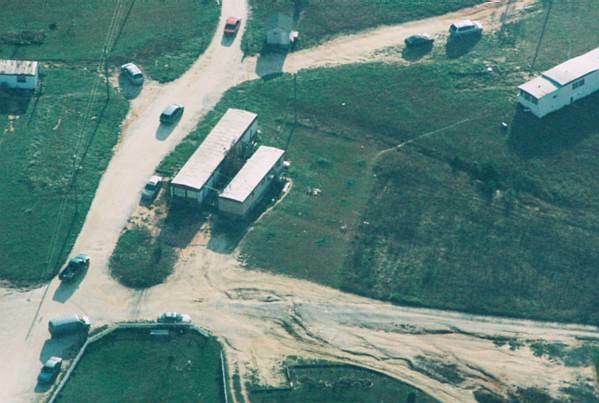 JF has established numerous compounds, known as “Jamaats”, mostly in remote rural areas in the U.S.A. and Canada. Jamaat ul-Fuqra has been named as a terrorist organization by the State Department. For more information on this shadowy group, see the Jamaat ul-Fuqra links on our sidebar, or visit the Politics of CP and look through his exhaustive investigative reports on JF in the archives. Note: some of the images shown below are thumbnails; click on them to see a larger version of the same image. 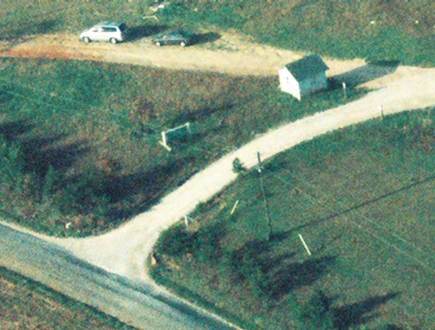 Martin’s plane circled the compound several times, giving the photographer an opportunity to snap a number of shots. 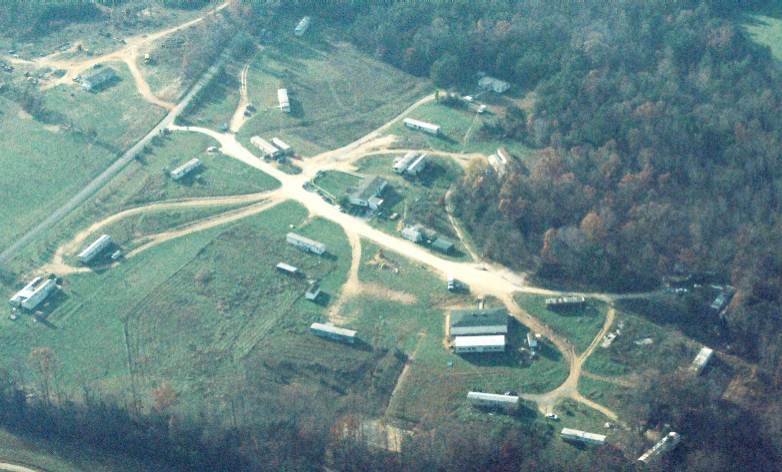 This is an overview of the main part of the property, looking approximately west. Rolling Hill Road (SR 615) is the paved road at the left. In this view of the compound’s entrance you can make out the guardhouse and gate, as described in my first post about Jamaat ul-Fuqra. 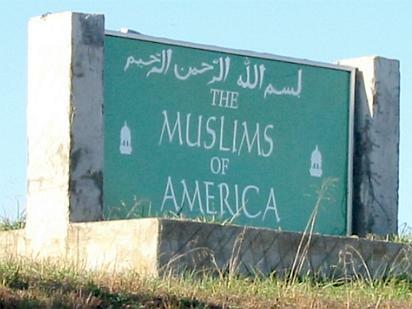 The Muslims of America sign is also visible in the center left of the photo. A close-up ground shot of the same sign is shown below. The “Sheikh Gilani Lane” street sign can’t be made out from the air, but you can be sure that it’s still there. These are some of the residences on Sheikh Gilani Lane. 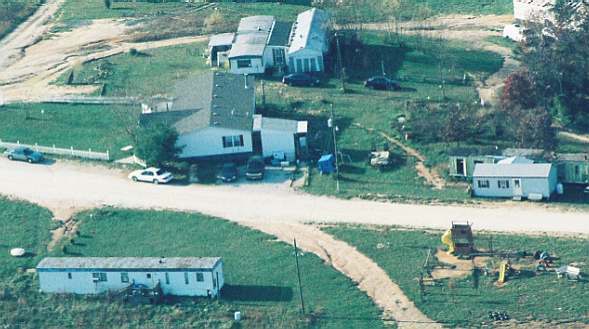 You can see that the infrastructure at the compound is far from opulent, but not all that unusual for this part of rural Virginia. Notice the extensive erosion problems on the ungraveled driveways. 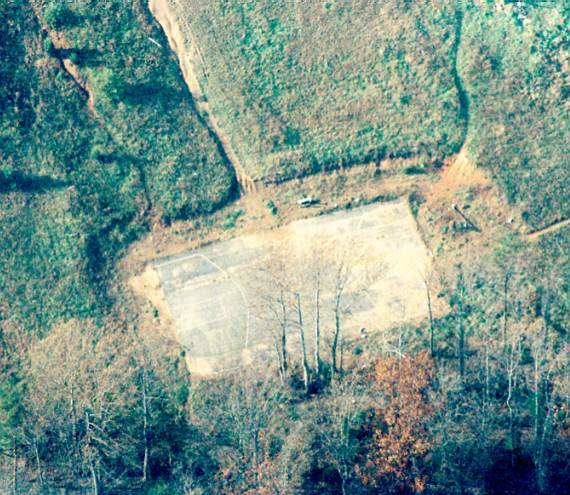 The feature shown at right appears to be a large concrete or asphalt slab, set in the hillside at the eastern edge of the main compound. 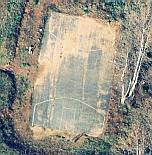 You can also see it at the edge of the trees in the overview photo. Its function is mysterious. 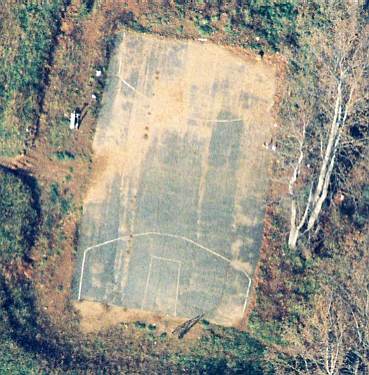 Is it a basketball court? If so, it’s unlike any court I’ve ever seen. There are no backboards visible, and the painted lines don’t conform to the normal basketball patterns. Not only that, but the paved area is not completely level. In this detail shot you can see that it has less of a slope than the surrounding hillside, but is still canted. If anyone has any other guesses about what it might be, please leave them in the comments. 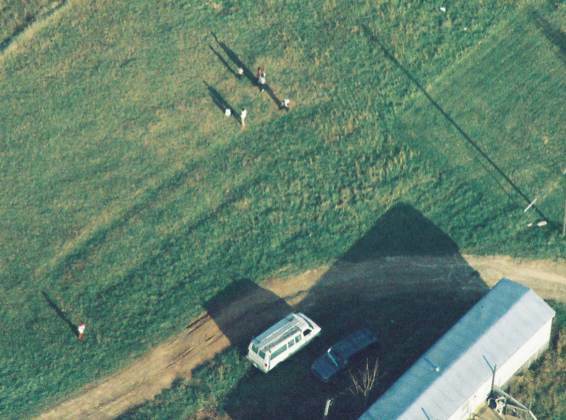 As Martin’s plane circled, people gathered in a field near a trailer to look up. After a few minutes they began moving at a rapid pace in the direction of Sheikh Gilani Lane. I have enhanced the contrast in the detailed view shown below, and the shadows make it clear that the figures were moving quickly. In another few minutes cars from various parts of the compound started up and began pulling out, as shown clearly in the photo at right. This behavior makes sense if one believes the earlier accounts about the Red House compound that cited it as a safe house harboring fugitives wanted on federal warrants. It was also reputed to be the place where John Allen Muhammad holed up to rest and reload during his Beltway shooting spree. But who knows? There may be some other reasonable explanation why so many residents of Sheikh Gilani Lane suddenly decided to leave when they saw an airplane circling overhead. Let’s hear it for the Christian Action Network! I’ll keep you posted on their future investigative efforts. Those clever fellows in the MSM never miss an opportunity to put a little kink in their news analysis reporting. An example from a headline in today’s Washington Post reaches NPR levels of dissembling. The article goes on to discuss the continuing controversy regarding the use of the cross at Wren Chapel, a story that has been going on since October, with no sign of abating. Back then, Gates of Vienna called it “Away in a Closet”, since that was what the King President of the college decided to do with the cross — which, until his dictat, had sat on the altar of the Chapel for more than seventy years. Many other blogs covered — and continue to cover — the story in all its grisly detail. The Post does give the URL for Save The Wren Cross, which has become the clearinghouse for this contretemps, one which will not go away, despite the college administration’s efforts to make it disappear. In October, President Nichol, without any prior announcement to the college community, ordered the removal of the cross from its accustomed place on the altar. It was to be stored in a closet and left there except for those times when it was specifically requested. YouTube ran a widely viewed video of the removal. As people noticed the bare altar and the news trickled out into the college community, there was a backlash of protest, not only about Nichol’s order but also about the way in which it was accomplished. Perhaps he thought no one would notice? Or that the passive student body would simply shrug and move on? Or that the alumni, far removed, would be indifferent? Wrong. First the students reacted, and then the word spread. 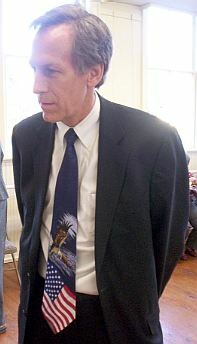 President Nichol stood his ground, claiming that some of those who used the Chapel found the cross offensive. I believe he’s been able to produce only one complaint so far. There are now over seven thousand registered complaints about his sudden and secretive decision to remove this offensive religious icon. Now the president has decided, in yet another fiat — which he labels a compromise — that the Cross will be returned to its place on Sundays, and that a plaque will be put up explaining the history of the cross. A very Anglican move, I should say. 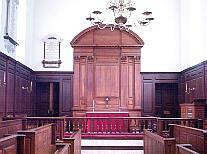 Anglican churches are full of plaques, and Wren Chapel began life as an Anglican church. Note that the “compromise” is designed and carried out by Nichol, without input from the college community. Poor Nichol. He doesn’t seem to have grasped the ideas behind discussion, collegial decision-making, or compromise. Obviously, he just wants the whole thing to go away, and the only trick in his repertoire is giving orders. In any other state school he might have succeeded. But William and Mary is so steeped in tradition they probably have Thomas Jefferson’s fingernail clippings in a reliquary somewhere. And the center and soul of that tradition is Wren Chapel: everything of any importance happens there. In fact, the Baron was initiated into Phi Beta Kappa in Wren Chapel, as was his mother before him. Phi Beta Kappa itself began there. As more than one person has said, William and Mary is the only state school that seems like a private university. Oh, and that’s another thing: it will never deign to use the term “university.” It began as The College of William and Mary, and thus will it remain. It was a state school begun by the Anglican Church to train clergy and scholars back when the Anglican religion was the state religion of Virginia, back when the Episcopal church was called the Church of Virginia. So William and Mary began life as a Christian institution and gradually transformed as the Commonwealth did. Eventually it became what it is today: a state-supported secular institution with a history and tradition of Christian parentage. Much of our common public life is being eaten away by a malign “tolerance” for “diversity” that is so ignorantly narrow-minded that it manages to cancel the average American out of its equation. It is not diverse in the least, it is in fact meanly perverse in its calculus. Larry Summers learned that at Harvard, didn’t he? That’s one place where the truth of biology does not, and will not, trump ideology. However, as some dedicated William and Mary students and alumni and Virginia citizens have proved, a passion for history and tradition can trump propaganda if we band together and demand that truth prevail and that tradition be maintained. The students aren’t finished yet, though. There is still the Board of Visitors meeting in February, when the matter of the Wren Chapel cross will actually be discussed instead of dictated — as should have happened in the first place. Meanwhile, returning to the WAPO headline, “School’s Move Toward Inclusion Creates a Rift,” I ask you: how accurate is that clever semantic twist? Reading it, can you guess which side the WAPO supports? 3,500 Austrian Muslims are departing for the haj, the annual pilgrimage to Mecca. Steve Decatur has a post with photos from the airport at Vienna, now busy with crowds of the traveling faithful. The reverse is not true for Muslims who move to Austria, or any other Christian nation. It’s a fact worth remembering. [T]hey are a sign that Muslims are no longer on the Gates of Vienna but are rather inside the gates and their invasion is well under way. A "Clarifying Moment" or Further Murk? The US has detained some Iranians in Iraq. In fact, American forces both stopped an Iranian embassy car to take two of Iran's diplomats into custody, and also entered al-Hakim‘s compound to remove several others Iranians. Many Shiite political groups are now suspected of having ties to Iran, and Sciri [al-Hakim’s group- ed. ] is no exception. Senior party leaders lived in exile in Iran for years plotting the overthrow of Mr. Hussein. Some married Iranians and raised their children there. It would appear that the Americans are attempting to hold the Shi’ite Iraqi government’s feet to the fire. There is on-going concern that the Sunnis will be particularly vulnerable in the coming era of Iraq’s theocratic democratic rule. I think he means that Iraq is going to have to be public and up-front about the incursion of Iranian insurgents into the country, insurgents tasked with killing Iraq’s American “guests.” With the arrest of people it suspects of targeting Americans, the militarily has thrown down the gauntlet. Let’s see if anyone picks it up. So far, Iran is uncharacteristically mum - considering these events started on Thursday, that silence in itself is interesting. Happy… uh… Holidays. Merry… um… Saturnalia. Have a joyous… er… Winter Solstice. Let’s celebrate… Yule. That’s it: Yule! Let’s cut down the sacred spruce and hang candles on its boughs, representing the stars pivoting around Yggdrasil, the axle-tree of the cosmos! Let’s participate in the ritual slaughter of the Corn God, and thereby destroy the old year to make way for the new! Join us at the Year’s Midnight as we cut the mistletoe from the oak with a golden sickle and then lower the Sperm of the Gods onto a silken sheet, recapitulating the death of Balder at the hands of Loki, and thus the birth of the new year! Shout for joy as the Priestess of the Moon raises her silver blade! Reader JDM has kindly translated parts of an article from last Friday’s Jyllands Posten. The full article requires a subscription; however, with the help of the Danish blog Uriaposten, JDM has been able to supply portions of the piece in English. It seems that France is not the dhimmi monolith that we’ve been led to believe. The interview with Chahdorrt Djavann together with the following interview seem to indicate either a growing or a previously unknown side of French society. I will note for the thin-skinned that this interview displays a typically modern European perspective (i.e., fairly anti-religious). I think this perspective gives some good hints on the direction that Europe will follow in dealing with Islam. In some ways I wonder if our respect for religious feelings in the USA may make our same struggle more difficult. Rather than accuse itself of all sorts of ills, the French philosopher Pascal Bruckner encourages Europeans to be proud of the values that the rest of the world desires. In his latest book, Pascal Bruckner accuses Europeans of being a bunch of masochists who, with guilty consciences because of the sins of their forefathers, have taken to self-loathing instead of standing up to our enemies, among them the Islamists. “It is always the intolerant who demand tolerance. Or people with no respect for others who demand respect. My point is that people have to stop feeling guilty. We have done nothing for which we should be critical and we bear no responsibility for the crimes of our forefathers. “We must not be ashamed of or values. We need to understand that our values are good and that they have aided in our survival under the worst totalitarian regimes that have ever existed — fascist, communist, and Stalinist. Our values are coveted by millions of people outside of Europe. We must not, therefore, in the name of tolerance back down when confronting enemies of tolerance,” says Pascal Bruckner. Nowadays, Pascal Bruckner warns, the world is in the middle of an ideological war which deals with the integration of a great religion like Islam into the modern secular society. In this war, it is important to choose sides. And it is important not to be caught in traps like the word “Islamophobia”, which is used to discourage and silence critics of Islam. “Everyone knows that the veil [scarf] is not neutral. It is an instrument used to make women feel shame if they show their hair. It implies that a woman’s face is a sexual organ, that her hair is satanic. The logical conclusion is that every woman who is unveiled is a whore. That was what happened in the [French] schools… until the prohibition of the veil. Western masochism is an overreaction to our spirit of critical inquiry that causes us to punish ourselves so much that the final result is a self-loathing. “[People in Europe] are tired of being faulted, as well as threatened. They are tired of living in constant anxiety of [terrorist] attacks. Of course, I have been attacked for being a reactionary, but not by many. It is as if I am part of a movement that I am also instigating. People have had enough. When the Cartoon Crisis was at its worst, she was asked by French TV to comment on the cartoons from Jyllands Posten. It happened on Antenne Plus, a live program so she could not be cut off. What did she think about the cartoons? They were wonderful except that they weren’t caricatures, but realities, updated realities, because obviously Mohammed should have a bomb in his turban instead of carrying a scimitar, that would be too old-fashioned. She stated this without blinking and straight into the living room of millions of French viewers. The show’s host was taken aback, but the show was live. Afterwards, the show’s producers said that further appearances by this shameless women would be perhaps limited. Djavann maintains her duty to be blasphemous. Why? Because she has a religious opponent and experienced this opponent’s actions in the ten years she wore the veil. And because she feels that Europeans must wake up while there’s still time: you are not tolerant, you’re ignorant. These days, she is a member of a government advisory council. There is also a French mullah on this council. “Why aren’t boys veiled?”, she asked with a smile. The mullah cleared his throat and answered that the truth of the Koran states that because girls are unclean from birth it is only natural that they be veiled. Against this level of stupidity, blasphemy is a duty. France — the new Denmark? The Channel tunnel has been targeted by a group of Islamic militant terrorists aiming to cause maximum carnage during the holiday season, according to French and American secret services. The plan, which the French DGSE foreign intelligence service became aware of earlier this year, is revealed in a secret report to the French government on threat levels. The report, dated December 19, indicates that the tip-off came from the American CIA. British and French intelligence agencies have run a series of checks of the security system protecting the 31-mile tunnel but the threat level, the DGSE warns, remains high. British security services remain on high alert throughout the holiday period. According to the French sources, the plan was put together in Pakistan and is being directed from there. The plotters are believed to be Western Europeans, possibly Britons of Pakistani descent. The DGSE say that levels of ‘chatter’, the constant communication that takes place between militants, has not been so high since 2001. Last week Sir Ian Blair, the head of the Metropolitan Police, described ‘the threat of another terrorist attempt’ as ‘ever present’ adding that ‘Christmas is a period when that might happen’. American security sources told The Observer that the threat was ‘sky high’. Those Chunnel trains must be a tempting target right now, packed as they are with Christmas holiday travelers. Since the advent of the EU there have been no customs or immigration checks at either end. When we took the Chunnel train back in 2002, we had to pass through an X-ray machine under the watchful gaze of security officers, but the scrutiny was lighter than it was at the airports. The detail in which the attacks have been planned in Pakistan will worry British counter-terrorist services. The UK is in a particularly vulnerable position as a result of its close alliance with America, its physical accessibility compared with the US, and its large Muslim minority, many of whom have links with Pakistan. Osama bin Laden and other key senior al-Qaeda leaders are thought to be based in the tribal territories along the Afghanistan-Pakistan border. There is believed to be a steady stream of British militants making their way to the newly reconstituted al-Qaeda bases in the region. More than 400,000 British citizens travel to Pakistan every year. Though the vast majority are visiting family or friends, some have exploited the ease of travel for darker reasons: at least two of the 7/7 bombers spent time in the south-west Asian state. That’s a startling statistic: 400,000 Britons traveling to Pakistan every year. Think how hard it must be to monitor the traffic — the plotters can count on a low probability of being watched by British intelligence as the move back and forth. Last week news reports in America detailed a squad of a dozen English-speaking militants, nine of whom are said to be British who, having sought out the al-Qaeda bases, have now been trained to a high level in terrorist tactics. The group is known as the English Brothers because of their shared language. Apart from the nine Britons, the squad is made up of an Australian and two Norwegians. It was reported that Bin Laden and other militant leaders hope they will lead a new wave of terror attacks on the continent. Eliza Manningham-Buller, director-general of MI5, recently disclosed that UK intelligence services are monitoring more than 200 networks and 1,600 individuals in Britain. She said that her investigators had identified nearly 30 plots ‘that often have links back to al-Qaeda in Pakistan, and through those links al-Qaeda gives guidance and training to its largely British foot soldiers here’. How many personnel does MI5 assign to these tasks? Is it like a CPS caseload, with one harassed, demoralized, and overworked caseworker for every hundred “clients”? Step 1: Official spokesman denounces the offender as a bigot and racist. Asserts that Muslims are just like other Americans, want to live in peace and enjoy the respect and tolerance that is their right etc blah yak. Step 2: Prominent non-Muslims fall over themselves to pile on the offending infidel along with CAIR. Step 3: If enough useful idiots don’t show up for step 2, twist some arms and call in favors until enough join the pile-on. Step 4: Saturate the airwaves with the CAIR message, as delivered by the usual reasonable-sounding talking heads. Step 5: Mau-mau the offender. This step includes veiled threats, overt threats, sabotage of the offender’s funding sources (if he’s in public office) or his employer (if he’s not), and any dirty tricks that might prove useful. Step 6: Repeat steps 1 through 5 until the victim is reduced to a smoking politically correct crater. Franklin County Sheriff Quint Overton said he had extra officers at the courthouse Thursday because Goode had received several threatening phone calls. Read the rest of the article — it’s an AP story, so you’ll find all the other steps highlighted, with the general MSM stance clearly laid out, in full Useful Idiot mode. Rep. Goode may not stand a chance, but we’re going to back him to the hilt here. The man has touched the new third rail of American politics: He dissed the Prophet. Regular readers will guess that we don’t support the exact way that our congressman stated his opinion, but we wholeheartedly back the sentiment behind it. And if we get a chance to talk to him, we’ll offer him some advice about how to wage the Counterjihad effectively, without offering the enemy any gaps in the armor through which he can slip a blade. I spoke to one of Rep. Goode’s staffers in a satellite office this morning, and he said the phones have been ringing constantly, and that’s he’s never seen anything like it before. Don’t let CAIR force him to back down. If they succeed, no politician holding national office will be willing to stand up to them. UPDATE: Dymphna reminds me that you should not use the Washington D.C. address. Mail arriving at his Congressional office gets quarantined for three weeks. Rep. Goode recommends that correspondents use the Rocky Mount address for the speediest delivery.